1. Pair blue with warm tones. If you’re not a designer, finding colors that complement one another can feel like a daunting task. One classic combo that never goes out of style is rich, warm wood pieces paired with any shade of blue. 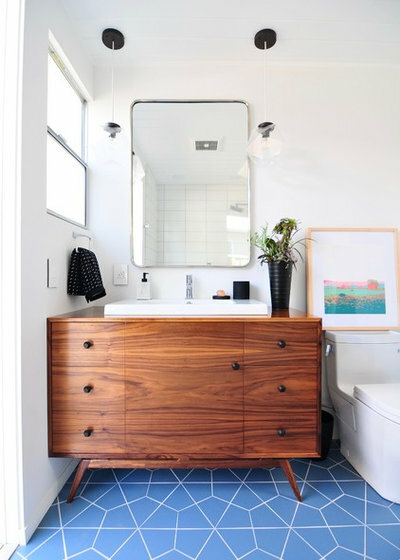 Here, bold hexagonal-pattern tiles brighten the floor below a custom midcentury modern-style vanity. 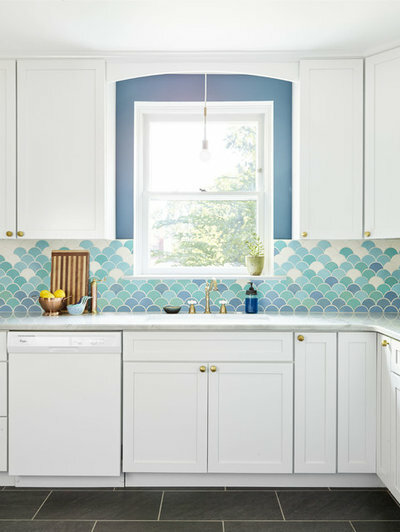 And here, ocean-inspired blues pair perfectly with the warm tones in the brushed brass hardware and faucet for a soothing effect. 2. Know your vanity storage options. 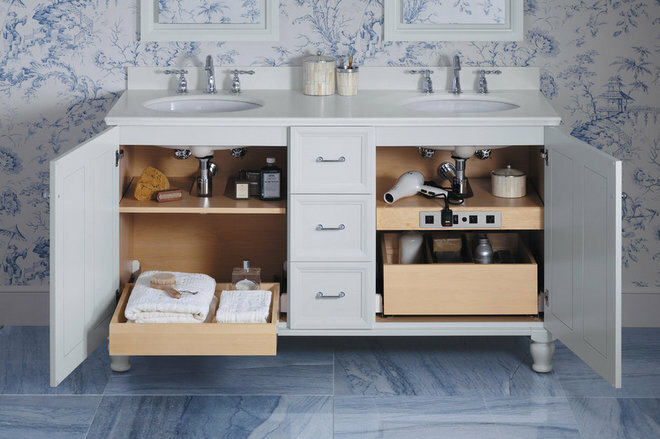 If you’re designing or installing a new vanity, or you’re looking to update your current one, there’s a lot to learn when it comes to storage. This week, designer and Houzz writer Yanic Simard takes a look at the various pullouts, drawers, cabinets, cubbies and other dedicated solutions for maximizing vanity storage. 3. 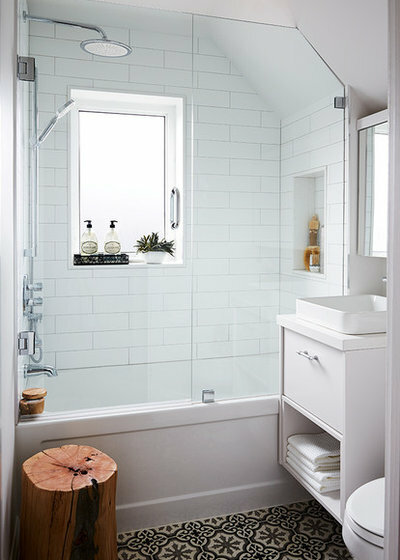 Try a frameless glass door for the tub. We often think of frameless glass doors as being only for walk-in showers. But in recent years, more options have come on the market that can give you the look of a sleek, modern glass door without the need to ditch your tub. It’s also a great way to visually expand a small bathroom, as shown here in this 50-square-foot Toronto space. 4. Bring on the plants. 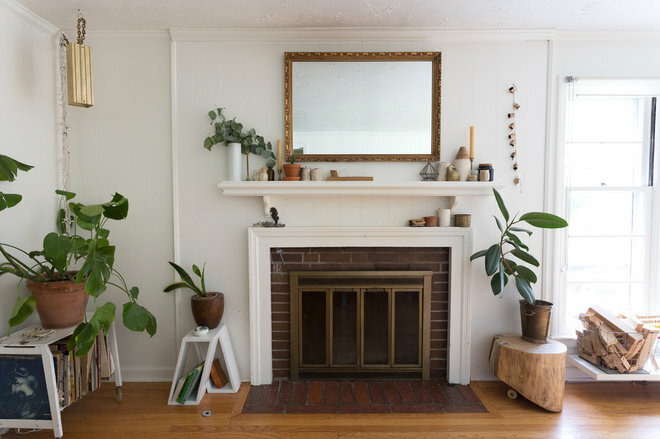 When browsing through the rooms in this Kansas home, you’ll notice one thing that comes up again and again: plants. Lots of them. 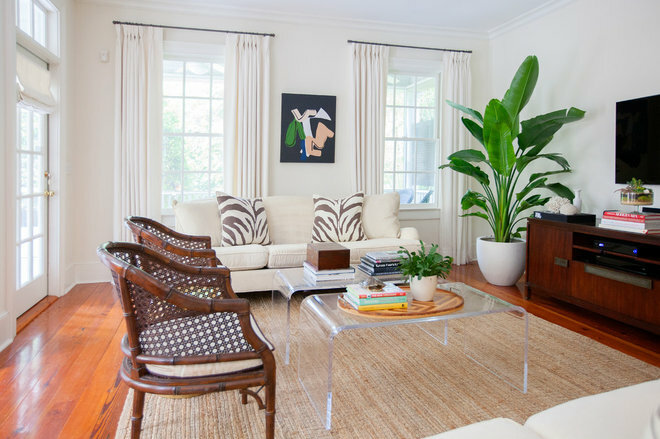 Every room is host to several green-leaved plants to the point where the house has the feel of being alive with charming character. If you’ve been feeling as though your home has been missing some subtle energy, it’s time to hit the nursery. 5. Consider whether you already have a design-worthy wood floor underfoot. Think you know what’s under that linoleum floor of yours? Think again. 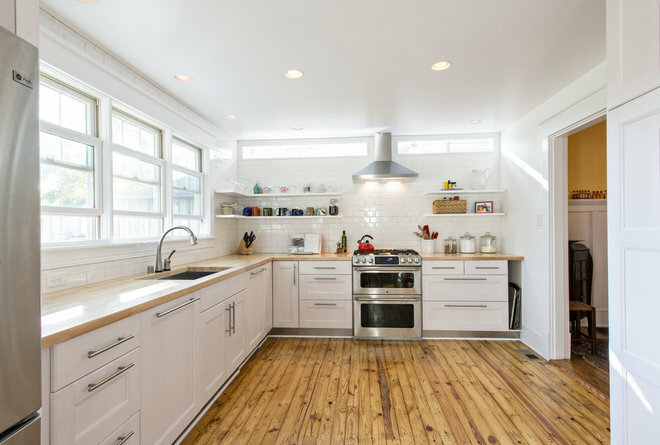 Houzz writer and editor Annie Thornton looked into several cases where homeowners pulled up their existing flooring to discover exquisite wood-plank subfloors that they adopted as their main flooring material. 6. Use materials to define spaces in open plans. Open layouts continue to be popular in many homes, but people can regret the loss of intimacy and delineation. 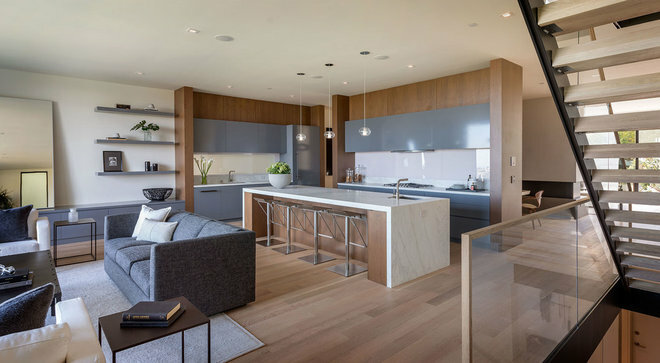 Architects know that the solution comes in the use of warm materials to offset an area or zone, as was done in the wood-wrapped kitchen shown here. 7. Check out acrylic furniture. In small or compact living rooms, sightlines mean everything. Chunky coffee tables can quickly overcrowd a room. For an airier effect, consider clear tables like the ones shown here that allow light to pass through freely. 8. Carve out a personal space. Most spaces in homes are set up in a way that’s meant for interaction, whether it’s chatting with friends or watching a movie together as a family or eating dinner at the communal table. But it’s important to have a small corner of space all to oneself. 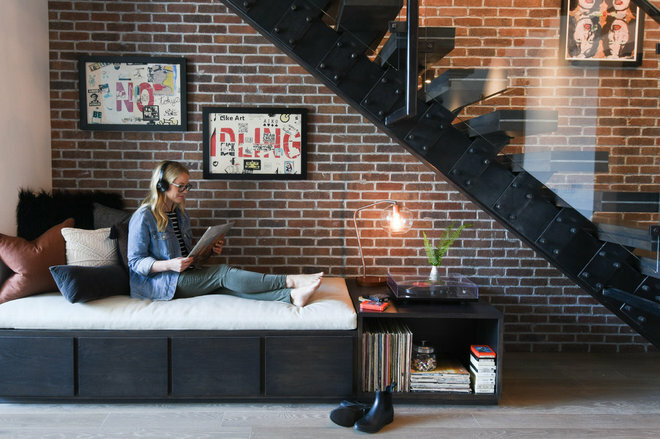 In this Montana loft, the homeowner created a one-person nook beneath the modern staircase for kicking back and listening to vinyl records alone.